Mama has, over the years, read her way through at least one book by most Russian language writers who are not poets. I wouldn’t say this has been a hardship, Russian writers are a lot less dour than they are given credit for. Except Dostoevsky. Don’t read him. But she has read nothing by Maxim Gorky. Which seemed odd given that he was a writer so famous they named the central park after him. The thing is, Mama came to Gorky via Alexander Solzhenitsyn’s Gulag Archipelago, a book about the extensive network of political prison camps, how they came about, what life was like in them, who got sent there and what it did to them. Gorky pops up in the bit about the building of the White Sea – Baltic Canal, a project notorious for the number of its laborers, the majority of them from the gulags, it killed. Gorky praised it. He also praised one of the original gulags out on the Solovetsky Islands after he went on a visit there. He is supposed to have righted a newspaper, held upside down in protest by a zek (political prisoner) at the fact that they had been cleaned up and given leisure time and so on for the visit, thus showing his understanding of the deception and his sympathies for the condition of the prisoners. But what he actually wrote about it was… different. So Mama had got the impression that Gorky’s fame was mostly built on being a Stalin apologist for hire, and didn’t really feel the need to delve much deeper. Because Mama does not approve of Stalin apologists. Whether for hire or not. During his time in the Soviet Union Gorky was given a house with a very fabulous staircase in it, and Mama has wanted to see this staircase for quite some time. So off, eventually, we popped to have a look a it. The Gorky House Museum came as a bonus. This house is one of a number of buildings in Moscow built at a time when Art Nouveau (what the Russians call Style Modern, with a decidedly French accent) was all the rage. The Gorky House Museum is a particularly shining example of this. Of course, it wasn’t Gorky’s house to begin with. No, it was constructed for the wealthy banker and industrialist, Stepan Ryabushinsky, who among other things started the first car factory in Russia. This was rebranded after the revolution as ZIL, the famous maker of Soviet cars, jeeps, tractors, trucks and so on. It’s been knocked down now, and is being turned into a cultural centre. Very Post Soviet Moscow. But the name more properly associated with the house is Fyodor Shekhtel, the architect, who had a number of Art Nouveau projects on the go in the 1900s. Most of these now belong to embassies so are hard to get inside. He also dabbled in some rather fabulous theatre costume designs. As you do. The Shekhtel House, then, is thoroughly Style Modern from top to bottom, with the possible exception of the hidden Russian Orthodox chapel at the top. Not because Gorky turned out to be a secret Christian in an atheist communist world, but because the Ryabushinsky family were Old Believers, a version of Orthodoxy that was frowned upon in Russia, well before the Revolution. Mama sold Art Nouveau to us by explaining that that artists of this persuasion tried to do is take the natural world, plants, flowers and ANIMALS as their inspiration. She sold a visit to the Ryabushinsky Mansion to us with the challenge of trying to spot as many of these little details as we went round as possible. This turned out to be a very fruitful pastime. There are animals (and plants) in the mouldings, the lintels, the wall and door panels, in the stained glass windows, as well as tiled areas on the outside. Th window frames are particularly fascinating. To Mama (no animals for us). But when we were chatting to the cloakroom attendant at the end of our tour, and she had got out the big Shekhtel book to show us more of the animal theatre costumes than were displayed on the walls, she also quizzed us on what we had spotted in the house. Turns out there are more animals than even my Animal Obsessed Big Brother had imagined possible, even though he had to hang around for quite a long time looking for them while Mama tried to get the perfect photo of the staircase. Now we know where more are to be found, we will have to go back. Don’t make the same mistake. There is an owl here. Can you see it? Anyway. The Ryabushinsky/ Shekhtal mansion is a pretty fabulous one by anyone’s standards, and that’s before you are told it was designed with air conditioning and spot lighting. And the fact that Maxim Gorky was given it moved Mama to perhaps think that she had better find out what the actual deal with was him after all. ‘Gorky’ is the Russian word for ‘bitter’ and is not his original name, which was Alexey Maximovich Peshkov. It turns out that Gorky grew up in difficult circumstances in Nizhney Novgorod, very nearly committing suicide around the age of twenty. Experiences arising from this childhood as well as extensive travel on foot around the Russian Empire led him into writing vividly angry journalism, vividly angry novels, vividly angry short stories, vividly angry plays and vividly angry essays of gritty social realism about the harsh realities of being poor or marginalised in Tsarist Russia in the late 19th century and beginning of the 20th . A very sobering contrast to the life of a cultured and fabulously rich merchant able to commission elegant harmonious living spaces from brilliant architects and contemplate the universe from his religious hidey hole in peace. In fact, Mama says as a writer and social commentator he was Charles Dickens on crack. Especially as he spent the (failed) 1905 revolution attempt in St Petersburg constructing home made bombs in some random apartment with a whole bunch of very energetic Marxists. After which he was exiled. Anyway. It was actually Gorky’s pre-revolutionary writings and activities that make him a hero of the Soviet Union, what with the favourable publicity and support that they brought to the cause when they went viral around the world. He was nominated for the Nobel Prize for Literature five times. Obviously he knew Lenin. He wasn’t, apparently, very impressed by Lenin, which is another point in his favour, says Mama, who is also not a Vladimir Ilyich Lenin fan. Although he did agree to front a Bolshevik fundraising drive in America at one point. In the end this was somewhat stymied by him taking along his girlfriend, rather than his actual wife, for the duration. The Americans were not, by and large, impressed by this, despite having much more time for his writing than you would expect given how thoroughly freaked out they seem to be if anyone mentions the phrase ‘socialised medicine’ today. Mama is in a decidedly spiky mood today, I see. Mama also notes that Maxim Gorky seems to have a thing for interesting women, which is probably the best thing about him. His wife, Ekaterina Peshkova, worked tirelessly to advocate for artists, writers and so on caught up first in repressions of Tsarism, work she continued, vigourously, in communist times as one of the most effective members of the Political Prisoners Relief organisation. And one of his later girlfriends was Moura Budberg. Who was a Soviet/ British double agent. After ending her association with Gorky, she ended up in England, where she repeatedly refused to marry HG Wells, of allegorical time travelling fame. She is also, incidentally, the Half Great (Great?) Aunt of Nick Clegg, which is possibly taking six degrees of separation a bit far, but still amusing to Mama. What with one thing and another (Lenin didn’t like him any more than he liked Lenin), after the actual revolution, Gorky left and went to Sorrento, along a fairly large household of girlfriends, his ex wife and his children, adopted and otherwise. The reason why he ended up back in Russia again is a bit unclear. Mama, who cannot entirely shake her initial bad impression of Gorky, thinks it is either because he ran out of money, revolutionary writings now being less popular around the world once revolutionary reality had engulfed Russia and the surrounding area, or because he wanted to experience first hand some of the adulation he was nevertheless still getting inside the USSR (being conveniently out of the way). He certainly got a very cushy number in the Ryabushinsky Mansion, but his return was definitely also a propaganda coup for the communist regime. It seems he was expected to act, as president of the Union of Soviet Writers, as a sort of cultural ambassador and host to writers and so on from abroad, with the magnificent Art Nouveau staircase and so on as a backdrop. So perhaps one shouldn’t see it as entirely a gift without strings attached. Especially as there is also a suggestion that, along with most of the rest of the Soviet Union inhabitants, fear of what might happen to loved ones, including his children, effectively constrained him from the outspoken criticism of a repressive regime that had characterised his early life. Here is his place at the table set up with tea things. He himself actually complained that the house was too grand. He also said that he was continually watched. Sigh, says Mama, who is not one of those people who goes around saying, deludedly, ‘if I lived at the time then I would have DONE SOMETHING’ from the perspective of a comfortable middle class lifestyle. And Gorky only actually lived for four years after his return the the USSR, dying in 1938 at the age of 68. His son died before him. Rumours that one or both of them were purposefully killed abound. Naturally. So, it might be better after all to focus on the interior of the house rather than the details of Gorky’s life, and thank our lucky stars that Shekhtel’s architectural masterpiece was, for whatever reason, preserved. At one point before Gorky moved in, for example, Gorky’s house was a kindergarten. An experimental kindergarten. !!!!!!!???????????!!!!!!!!!!!!!????????? Says Mama, worried about her staircase. Whhhhhheeeeeeeeeeeeeeeee! Say I, and my Obsessed Big Brother has just gone green with envy. Among the preservees, says Mama, who is clearly determined to cram every last little tidbit of information she knows about this building into this review, was Nadezhda Peshkova, a painter and Gorky’s son’s widow. She lived in the house until 1965 and was then instrumental in having it turned into the Gorky House Museum. That said, there is a certain lack of fine detail in some of the restoration. Russia, Mama says, is clearly not very used to actually having anything left to preserve and restore, so they do not seem to be doing a very good job of it. Rebuilding whole palaces from scratch in Kolomenskoye and Tsaritsyno parks is really not quite the same. Told you she was in a funny mood. The staircase, in particular is TOTALLY worth it. Although we really preferred the jellyfish lamp. And if you go up the stairs and look down, be sure to notice the turtle styling from above, this being another of the little secrets given to us by our connection in the cloakroom. The Memorial House Museum of Maxim Gorky’s official website. Address: 6/2 Malaya Nikitskaya, just up from Tverskoi Boulevard, and across the road from the very church where Alexander Pushkin got married to the most beautiful woman in Russia. Opening: Wednesday to Sunday, 11am to 5.30pm. Every third Thursday in the month Gorky’s house is also closed. Admission: Adults are 300 roubles, kids are 100 roubles and if you are very obviously foreign like Mama you pay 400 roubles. Don’t forget to add the photo pass for 100 roubles. Getting there: The nearest metro stations are probably the three connected ones of Pushkinskaya (purple line), Chekovskaya (grey line) and Tverskaya (green line), although see also Arbatskaya (both blue lines) and their connectiong stations on the red and grey lines, and also Barrikadnaya/ Krasnopresnehskaya (purple/ brown lines). It’s a good ten to fifteen minutes walk from any of these. Our visit to the town of Kolomna in the Moscow region is an object lesson in why you should pay attention to your surroundings in an unfamiliar place, as well as keep your mobile in the back pocket of your jeans and not an outer area of your coat when it is minus 15 degrees. Because at some point Mama got separated from her party and found herself in the middle of the biggest snowstorm in seventy years in the dark with no clear idea of the direction she should be going in. And her phone had died from the cold. She could have retraced her steps – we are not talking serious levels of peril here. Mama is not that kind of travel blogger. But she was tired, and was also attempting one of those complicated parental manoeuvres where you and your Significant Other swap over which child you are looking after in the middle of an excursion. Tracking back down my Oblivious Big Brother, happily scoffing pancakes in the warmth of a cafe, would have meant this relay would not have happened. So she asked the first person she saw for help. Now the problem with asking a local for help is that they don’t know the name of the hotels. And although Mama had previously clocked with amusement it was on a street with a very typical name for a street in a town in Russia, she couldn’t at that moment remember what that was. Lev Tolstovo Ulitsa? Leninskaya? Pushkinskaya? Unfortunately, all of these also exist in Kolomna, so this insight was not helpful. Locals also don’t necessarily know the location of every random museum Mama might have happened to visit nearby to where she was staying. And saying to someone ‘it’s on the street with the really attractive houses’ is really not a helpful thing to say in Kolomna. At all. But luckily ‘it’s next door to the McDonald’s’ is. Thus, Mama was escorted ten minutes out of the Russian man’s way back to the street Oktyabreskaya Revolutsia, and was able to successfully take over supervision of my pig-headed determined effort to lounge around at the Hotel Kolomna rather than engage in tourism. Mama thinks I have watched too many episodes of the (admittedly excellent) travel show Oryol i Ryeshka (Heads or Tails), in which one presenter gets to experience a destination in luxury and the other has 100 dollars to spend for three days. I was distinctly more interested in exploring the facilities in our accommodation for the whole of our first day, and decidedly frustrated every time we didn’t get further than the lobby before sauntering back out again to visit some other attraction. Eventually I flatly refused to go anywhere else. Which is how Mama and Papa came to be at opposite ends of the town in the first place. Well, to be fair, it was very cold, and a free excursion courtesy of the hotel didn’t really sound that interesting. Mama begs to differ though as she found out quite a lot about the history of Kolomna. Kolomna is directly south of Moscow and on the Moscow River, and thus of some strategic importance in Moscow’s long struggle for dominance in the area. It was officially first recorded as existing in the 12th Century. There’s a socking big statue of Dimitry Donskoi outside one of the remaining walls which commemorates the time he gathered his troops in Kolomna before marching actually some considerable way away to have the battle of Kulikovo in 1380. Which he won, and although it’s one of those victories which has definitely grown in the telling, in the Russia origin story it marks a sort of turning point both in the decline of the power of the Mongols in the area, and also in Moscow beginning to claw its way up, in a sea of competing small Eastern states. Worth a statue, then. Not that Mama has a photo of it because at that moment in the tour she had lost the feeling in her toes and was wondering if perhaps I hadn’t made the right choice after all. The Kolomna kremlin is also worth gawping at as it eventually graduated from being a wooden construction to more durable walls a bit more than a hundred years or so later, some of which still remain. Quite impressively. ‘Kremlin’ being, you understand, the Russian word for fortress, not something special to Moscow. There’s a whole set of them scattered along the border of medieval Moscow’s influence, mainly as a protection against the raids of Crimean Tarters. The next big skirmish Kolomna was involved in was during the Time of Troubles in the 16th Century, when the succession to the throne was contested by a succession of False Dmitrys pretending to be the son of Ivan the Terrible (the name is a clue that they did not, in the end, win the argument). Maria Mniszech, who was, optimistically, married to both of them, took Kolomna during the fight and harried Moscow from there, until she herself was captured and imprisoned in one of the towers that is still standing. Today it still bears her name. And, apparently, her ghost. The kremlin walls are incomplete now, not because of their failure to keep anyone out, but because during the 18th and 19th centuries the building materials were re-purposed by Kolomna inhabitants for other things. But as well as some walls, there is a gatehouse and those towers to admire, and you can tour the top of the walls too if you join the right excursion. There are a number of churches and monasteries inside the kremlin territory or scattered around the town. So if you are into your Orthodox ecclesiastical architecture, Kolomna is a great place to visit. Mama would like to draw your attention particularly to this church, Krestovozdvizhensky Cathedral, and especially to the splindly red and white towers you see surrounding it. Look familiar? They should if your read our blog as they are by the same architect who was responsible for the Gothic gingerbread palace for Catherine the Great in Tsaritsyno in Moscow (not that Catherine appreciated it). Mama, however, was more interested in the wooden village style houses. Many of which have gone full on quaint, especially if they are near to or inside the kremlin. Of course, pausing to take another photo every few minutes probably didn’t help the problem she had keeping up with the Russians in her party. Mama is unclear if she is just terminally unfit or has not yet developed enough of an irritation with wading through ankle deep snow to have worked out the best way to do it. Aside from photography there are a number of museums to choose from when you visit Kolomna. We went to the main Kolomna history museum, which started off in prehistoric times and the natural world and worked its way up from there, as small local museums are wont to do. Mama has clearly been in Russia too long – she no longer finds the idea of bears, wolves and so on particularly exotic as part of the local wildlife scene. But she did get quite excited by this odd looking creature. It’s a wolverine, apparently. Anyway, aside from walls, what Kolomna is mostly known for is industrialism, so there are a number of exhibits about that, especially the locomotive factory. Mama was more distracted by trying to take a photo of the model of the centre of town from every conceivable angle – she was determined never to get lost when visiting Kolomna again – and by the discovery of an English grandfather clock. This shot shows where she was standing while taking the two kremlin wall pictures above. The haunted tower is on the right. That said, what they do not seem to make much of in the museum is the reason why Kolomna is still not officially on the list of Golden Ring towns – the recommended list of places in the Moscow region which tourists might like to go and visit if they fancy a few days away from the capital. Despite it being super pretty and relatively convenient to get to. This is that it was a closed town until 1994. Closed towns were the ones which had some kind of strategic military importance, and so there were restrictions on foreigners visiting. The strategic importance of Kolomna were the armament factories. This history is hinted in the Museum of Military Glory (fabulous name. Mama says, dubiously). Observe the diorama of shell making! The museum is small, but the guide was enthusiastic about pointing out the equal participation of women in the death and destruction industry in the Soviet Union generally, and the Great Patriotic War (World War Two) in particular. Hurrah! It is also one of those museums that takes a personal approach to history, with most of the exhibits being illustrated by pictures, stories and artefacts of real Kolomna natives and residents. Mama was particularly determined to draw my attention to the photo and letters of one of the Night Witches. This was a squadron of lady bomber pilots, fabulously nicknamed by the enemy as somehow it was much much worse to be killed by females than by your regular Red Army fly boys. Kolomna has an aerodrome nearby, and the flying club attached to it has a long and venerable history. Currently it has a reputation for being a particularly good place to go and learn about parachute jumping and sky diving. If you are that way inclined. This is one of the first instructors at the aerodrome. Of the other places of interest available on your Kolomna visit, the one that was enthusiastically mentioned as a top attraction by everyone Mama spoke to about her trip is the Pastila Factory Museum. Pastila is a fruit sweet, and the museum is very well worth the fuss, being interactive, immersive and ending with a guided pastila tasting and tea. We all echo the recommendation therefore. Here is what we wrote about it in more detail. And then there’s the museum to the life and times of the local writer, Ivan Ivanovich Lazhechnikov, who in theory is famous for being one of the first writers of historical fiction in Russia (think Walter Scott). However, because finding a connection to Alexander Sergevich Pushkin, the (greatest) poet (who evah lived), is a national obsession, much is also made of the fact that he also saved Pushkin from a duel by getting the other guy to apologise. But didn’t Pushkin die in a duel, I hear your cry? Yes, indeed he did. Just not this one. Clearly toxic masculinity is not a new phenomenon. The museum is mostly just a collection of odds and ends and a few dressed up dummies in Lazhechnikov ’s reconstructed family home, and Mama did not, if she is absolutely honest, find it all that interesting. But it does have some nice furniture and she has made a mental note to see if there are any translations of the great man’s works. Other museums that caught our eye were the one about a type of gramophone, the one about life on a communal farm, and also the ones more dedicated to crafts such as soap making, and honey production. Also with very tempting shops attached. If all of this history, culture, boutique shopping or parachuting palls, you can check out the fancy new sports centre, which is mainly there to house a top of the range speed skating rink. Even if you are not into speed skating, you can hire skates and whiz round the rink in the comfort of indoors. Or you can do what my Oblivious Big Brother particularly enjoyed, and slide on your tummy down the moat of the kremlin walls. Over and over again. At least someone enjoyed the snow. There are also a number of pleasant cafes and eateries dotted about, in addition to the MacDonald’s. But what about the hotel, I hear you cry? Did it live up to my expectations? In Mama’s view the Hotel Kolomna was a perfectly respectable three star hotel. The communal areas were pleasant, and they have such facilities as their own gym, restaurant and cafe. The rooms included sturdy examples of the sort of furniture you usually find in hotel rooms. The beds were comfortable, the en suite bathrooms were fully equipped, and the carpets were thick. Everything was clean. Check in was smoothly accomplished, and reception was able to lend Mama a charger to revive her dead phone, which she was particularly happy about. Hotel Kolomna was, in short, a bit better than some of the motel chain hotels she has experienced in the UK and decidedly less grubby and with better fitting windows than a couple of the B&Bs. Also, being a pretty large hotel building and able to do economy of scale, it was also cheaper, especially off peak in a blizzard. Mama isn’t sure how good anyone’s English is, but she can definitively say they didn’t have any trouble coping with her wayward Russian, which is a good sign. And all of the information, hotel services, rules, general information, comes in English as well as Russian as standard. So they can probably manage foreigners. In short, Mama quite recommends it, especially as it is within a reasonably short amble of the pretty bits of Kolomna and the station. On Oktyabreskaya Revolutsia street. Remember this. It might come in handy. Obviously, other hotels, hostels and sleeping arrangements are available. Not that you absolutely need to make an overnight stay of it. Getting to Kolomna to experience all of these things is simplicity in itself even if you do not have a car as there are regular trains from Komsomolskaya station. You can get the basic local train, the electrichka, which will have hard benches to sit on and stop in more places, or the express, which shaves only a few minutes of the approximately two hour journey, but will definitely have better seats and free wifi as well as a refreshment trolley. So you should definitely visit Kolomna. Mama thought that the off season in winter was a perfectly reasonable time to go, especially if you like to photograph wooden houses in a layer of freshly laid snow, but doubtless Kolomna will be equally as pretty in full summer. And there will be all sorts of festival-type celebrations for major holidays such as New Year, Maslenitsa, Easter or the May holidays too. This is what the Hitchhiker’s Guide to the Galaxy has to say about the Night Witches, Russian combat pilots of World War Two. People in Moscow are always asking Mama for directions and she has a theory about this. Of course it could be because sometimes she forgets to change her streetside face from the British perpetual half-smile to the less welcoming Russian deadpan stare. But in reality Mama reckons that when you are in a place where asking for directions requires the effort and concentration of talking in a language you aren’t completely comfortable in, you tend to be a lot more conscientious about looking up where you are going, what it will look like when you get there, how much it costs, where the cafe is and so on and so forth than you do when you can amble vaguely in what you assume is the right direction and hail people casually for help if your destination isn’t where you think it ought to be or, indeed, open. You tend to look confident as you stride purposefully along the streets, annotated map in pocket, and this means that other less well-prepared passers-by assume you are the person to stop and dither at. They used to bother Papa rather than Mama in London too, for example. Although that might just be because Papa gives off experienced urbanite vibes wherever he happens to be, born and bred capital city dweller that he is. That said, Mama’s particular downfall when going places in Russia is not so much in inability to get people to tell her stuff but read signage accurately, as demonstrated by our trip to the wooden palace of Tsar Alexei Mikhailovich in Kolomenskoye Park this winter holiday. Alexei Mikhailovich was the father of Peter the Great, and this palace, or rather the original as this is a reconstruction, was where he spent most of his time growing up. It was really supposed to be a summer hangout, but Tsar Alexei liked Kolomenskoye so much he had this giant wooden 250 room construction built, which people told him at the time was the eighth wonder of the world. As you do, when your Tsar is really really into something. This seems to have been the sum of Alexei Mikhailovich’s achievements, aside from marrying two women whose families really did not get on, and dying a bit too early. He sounds somewhat wet, in fact, although just progressive enough that you can see from where Peter the Great got his compulsive need to shave off beards and build an entire city on a marsh in the middle of nowhere so he could get to Europe a bit more quickly. As a spur of the moment trip out suggested by Papa and a place we had already noted as interesting when we came across it one spring, Mama didn’t do any further research other than remind herself of which Metro stop to get off at. She had even had a chat to the woman in the ticket booth last time out about what there was to see inside and everything! Nothing further to worry about! Unfortunately, it turned out that there was more than one thing to see inside, and all of them needed separate tickets. This was complicated by the discovery that Tsar Alexei Mikhailovich’s palace was one of the museum buildings offering free tickets during the winter holidays. To some, but crucially not all, of what was on display. So Mama enrolled the services of Bilingual Big Brother to figure out what we should ask to go and see. The problem with Bilingual Big Brother is that he is nine and even with Mama’s determined efforts to cram us full of heritage and culture, he probably only had a vague idea of what Mama was after. Translation can only take you so far when you can’t quite conceive of what ‘nice old (replica) furniture and furnishings’ might consist of. And the problem with the ticket booth that Mama chose to stand in front of this time was that it was only selling tickets for the exhibitions at this end of the complex. Mama did not realise this, probably because she only bothered to read the first line of the sign that told her about the other ticket booth. So we ended up touring two (2) exhibitions, neither of which included fancy recreated interiors, before Mama overheard one of the docents telling another visitor that to actually get into the palace proper, they needed the other cashier round the other side of the building. Which, when Mama studied it properly, did look a lot more impressive. Mama thinks they should have built the palace of Tsar Alexei Mikhailovich the other way round, given that it is in a different part of the park from the original, so they could have quite easily erected it so that the entrance to Kolomenskoye Park is right next to the front rather than the back. Although this, of course, is why they put up signs. Hey ho. We got to see a collection of various typical folk art and crafts such as hinges, enamelled tiles, painted wooden trimmings and icon frames. Big up for the icon frames from me! They have cartoon-like pictures telling a story round the edges. I was fascinated to realise that the tales are frequently of how the main character is dismembered in different ways. Something I insisted on double checking at length with Mama. She wonders if my lack of freaked-outedness means it is time to pay much more attention to what I am watching on YouTube. We also got to see modern artists’ recreations of traditional folk art and crafts in a more 3D format. This consisted of bit less focus on the bloody bible stories and a few more animal carvings, but it was also quite pretty, and largely deserted. But I was not up for any more. I had already done my bit culture-wise. I had taken an interest. And now I was hungry. Mama, on the other hand was determined. I have developed a way to cope with Mama determined, unlike my Bilingual Big Brother who is easy to bribe. I am capable of keeping up a not-quite-subvocal-enough repetitive whine regardless of what Mama promises or threats for literally hours. The scowling is pretty impressive too. She gets her own way, but she doesn’t enjoy it and I live in hope that one day she will just learn that it’s better to cave quickly. What it meant on this occasion is that we had to take the interiors at something of a brisk trot. Or as much of a trot as we could given that the free entrance meant that there were quite a lot of people inside. If I had been more in the mood I am sure I would have been delighted by a number of aspects of the fancy-pants wooden palace. Obviously one of them is that it is indeed wooden. Both inside and out. Mama, however, was particularly taken by the medieval central heating system, in the form of the beautifully tiled enclosed stoves. She was also delighted to find that Alexei Mikhailovich had much the same taste in wallpaper as her. My Bilingual Big Brother was pleased with the lions in the throne room, which roar. These days it’s all done with electricity, but back then there was a much more mechanical way to impress visitors. The dressed up guides were pretty fabulous, and we got to see a lot of them as the palace was so busy. But obviously not listen to then because I couldn’t be having with that in my state of mind. What Mama particularly coveted (aside from the wallpaper) was the Royal bathroom/ sauna. I just wanted the swan in the dressed feasting chamber. Although, as I repeatedly told Mama, it’s not actually real. Neither is the tower and wall cake, Mama says sadly. Still, all in all worth tracking down. Just make sure you go round to the front of the palace for admission to the reconstructed interiors first or your six-year-old will not appreciate it properly and you’ll have to take her to MacDonald’s after all. Although admittedly that meant we had to trek right through Kolomenskoye Park first. Which, funnily enough, is a lot less attractive in early January when there is unaccountably no snow, than it was in spring. Want more ideas about what to do in Moscow? We have a comprehensive guide to the capital of Russia here. The palace’s page on Kolomenskoye Park’s website (in English). This is what the Hitchhiker’s Guide to the Galaxy has to say about children’s treehouses. Opening: Tuesday to Sunday 10am to 6pm. Closed Mondays. Admission: 400 roubles for adults for the palace. Kids under 7 are free. Other exhibitions need separate tickets and cost extra. Getting there: Metro station Kashirskaya (green line) is right next to the entrance to Kolomenskoye Park which is right next to the (back of) the palace. Kolomenskoye metro station (also green line) puts you at the other end of the park, which is a considerable walk away from the palace. 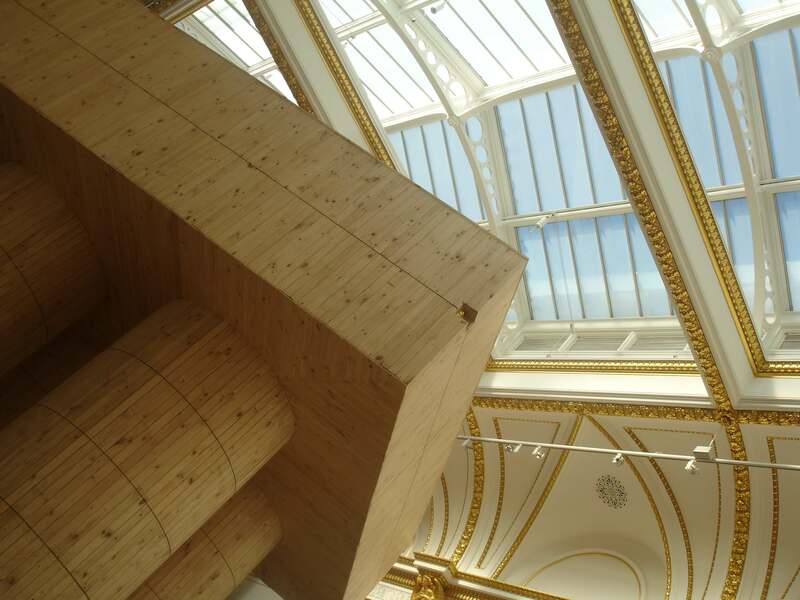 The success of the recent(ish) Sensing Spaces exhibition at the Royal Academy of Arts can probably be summed up by my reaction to the first installation we came across. I stopped short and breathed WOW! in an awed voice. Well, you would wouldn’t you? A huge square wooden War of the Worlds alien, dominating what in the normal run of things is a very classically proportioned room, complete with gold angel trimmings? It was impressive stuff, especially when it turned out you could scramble up and down twisty steps in the legs or run up and down a series of shallow ramps to get into the box on top and squint though slits at the punters below or the ceiling mouldings above. We did that a lot. I do like a good staircase. My Wonderful Big Brother liked the ramps. Mama liked the spy holes. Something for everyone. 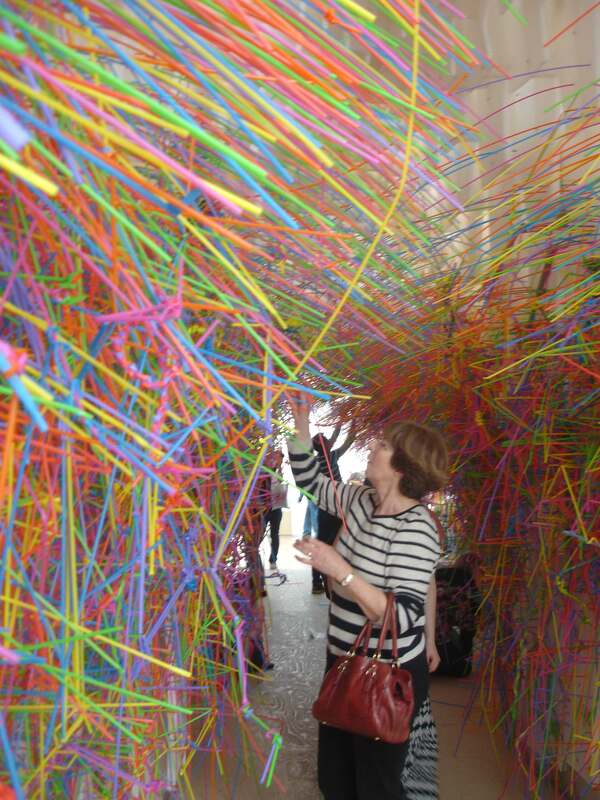 We also approved of the room with the tunnel of straws. 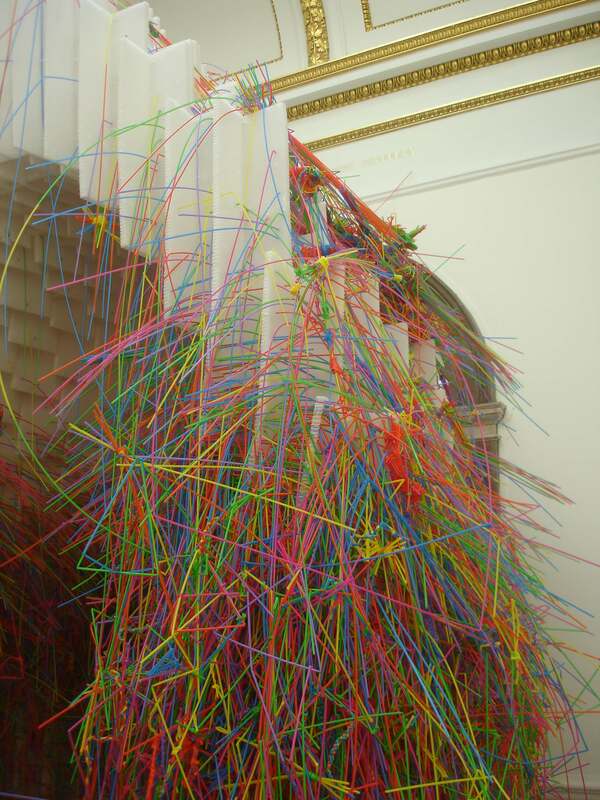 Of course, manual dexterity is not really my Wonderful Big Brother’s thing, so he didn’t really get involved in the suggested activity of adding our own creations made from long coloured plastic tubes. And I would have preferred removing the fruit of the other visitors’ labour. But it was nice to be able to touch something so visually attractive and tactile, and nice to see the many many adults’ little faces all lit up as they all threw themselves enthusiastically into the crafting opportunity. 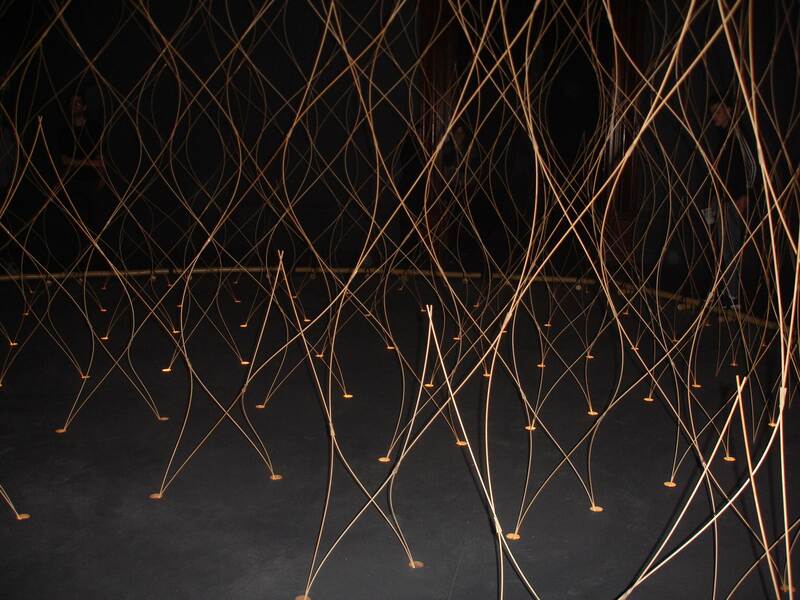 Next up was dashing around a stick-walled maze, interspersed with lots of little wooden wendyhouse type rooms for us to explore. 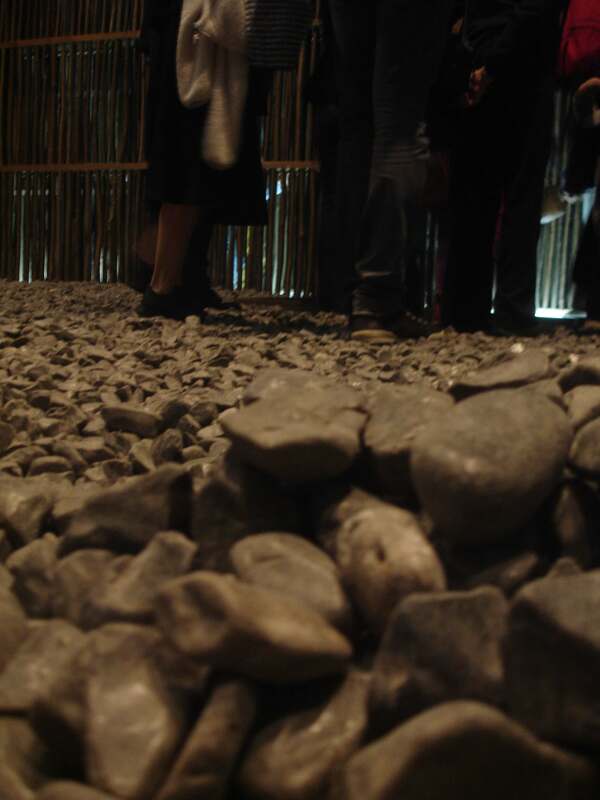 At its heart was a pebble room, which made truly satisfying crunchy noises as we stomped around it. We spent quite a bit of time in there building cairns. Just like being at the beach! Without all the inconvenience of being boiled by the relentless sun, covered in eye-stinging sunscreen, getting sticky from ice cream, or having to deal with all that salty wet stuff. Mama definitely approved, and wonders why more playgrounds don’t replace the unpleasantly gritty sandpit with a nice pebble box instead. Not everything was to our taste. There was an exhibit which mostly involved standing still and looking up rather than whizzing around and touching stuff which we were less impressed by although the big people seemed entranced. And while Mama LOVED the dark rooms with the mysteriously lit thin sticks we all thought looked like fire, I found it positively frightening refusing to let her into the second part altogether, and my Wonderful Big Brother lost interest when he realised he wasn’t allowed to fling himself into the middle of the flames. But overall it was by far the most interesting high art experience Mama has dragged us off to, and it’s a shame she can’t recommend it because it has now closed, and the various exhibits sold off. There is a wider point Mama wants to make here though. The reason we went to this exhibition in the first place was because the RA had made an effort to market it at parents and their children, going so far as to host a get together of Brit Mums bloggers in their cafe (with the opportunity to go round Sensing Spaces for free afterwards). The reason why we went back with my Wonderful Big Brother in tow and paid actual money to get in was because Mama was impressed on this visit by the staffs’ genuine commitment and enthusiasm for getting the kids in and letting them have at it, and damn the noise and sticky fingers. Even the doorman was jolly. Admittedly, this sort of attitude did encourage all the many many kids who were subsequently taken along to Sensing Spaces to think of the exhibition as a playground, and so the whole experience was a tad confusing as we were all were alternately encouraged to get stuck in and then sharply pulled up when we did, nearly bowling over an elderly art patron or shattering a large mirror in the process. As a result, the air did rather ring with desperate cries of ‘Not quite THAT fast/ loud/ energetically, honeypie!’ as the exhibition did rather too good a job of stimulating us. Mama also wondered if the non-children-encumbered patrons were enjoying the chaos as much. But the atmosphere seemed pretty good humoured, and our enthusiasm certainly got a lot of amused glances. She is forced to conclude that perhaps everybody was secretly delighted by the opportunity to wreak a bit of havoc in an art gallery. Anyway. Mama thinks the Royal Academy might be worth keeping an eye on. It’s a wrench, of course, to part with a full £14 in a city where there is so much free stuff to enjoy, but certainly the next time they say their latest offering is child-friendly, then we should probably believe them. And if they say it often enough, there are membership options to consider. Just leave the pushchairs at home. There isn’t room in the cloakroom. The Royal Academy of Arts’ website. This is what the Hitchhiker’s Guide to the Galaxy has to say about the world’s most beautiful buildings. Address: Burlington House, Piccadilly, London W1J 0BD. Opening: Sat to Thurs 10am -6pm, Fri 10am -10pm. Price: This exhibition was £14 for adults, under 17s free. By tube: Piccadilly Circus (Piccadilly and Bakerloo lines) and Green Park (Jubilee, Piccadilly and Victoria lines). By bus: Lots of buses! 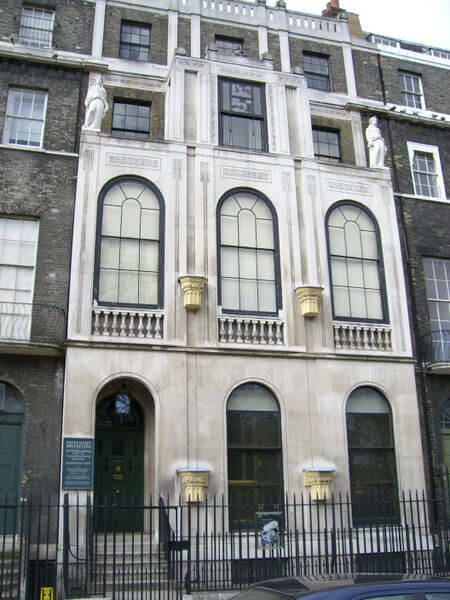 I am forced to admit that the Soane Museum, based on the collection of architect Sir John Soane (1753 – 1837), is not for the fainthearted toddler mamas out there. Housed in a perfectly ordinary London townhouse and the two either side Sir John bought when his collection of architectural knickknacks started getting out of hand, it is both cramped and stuffed very full of really fragile objects. A bit like the British Museum, but on a less national scale. Or Papa’s loft, but with fewer amplifiers, turntables and many many cables and more bits of cornicing, gargoyles, stone urns, sarcophaguses and busts of random strangers. It is, in fact, very much the sort of place where people whose first instinct is to run around with outstretched sticky hands and whose second is to find anything breakable within reach are not particularly welcome. And it is not pushchair friendly, not pushchair friendly at all. So Mama was quite smug that she had anticipated all of this and turned up without my Amazing Big Brother and with me in a sling, forethought that had the museum authorities direct a distinct look of approval at my immovable status. They still made Mama leave her big bag at the door, only permitting her to take her valuables round in a clear plastic bag held strictly in front of her to prevent, I suppose, accidental brushings up against precariously perched bits of statuary. Mama’s usual habit of feeding me rice cakes to keep me quiet was also vetoed – no food and drink of any kind inside the house. Or stilettos. I don’t know what they are, but they sound like fun. Mama says not though. Be warned. Plan accordingly. As for the museum, Soane’s special interest being something my Mama knows nothing about, she really should have bought the guide book, particularly as this is a museum somewhat lacking in explanatory labelling or any apparent logical order to the items on display. The attendants are happy to chat about the rooms, however, and what Mama did glean is that while Sir John was pretty successful as an architect, most of the money used to buy the collection came from an unexpected but massive inheritance by his wife. Acquiring the collection dented this so little that Sir John left such a vast amount of money in his will that it was only relatively recently that the museum has really had to work hard to search out more funding. Did the man not have anything better to do with his (wife’s) money, I hear you cry? Well, he quarrelled badly with his two sons, and seems to have set up the museum as a way of keeping them from getting any (more) money out of him. Mama remains rather worried about the sons, despite the evidence they were extremely unsatisfactory offspring. She is a sucker for put upon children stories these days. I blame hormones. Of course, Mama is also prone to saying things like, shame the wife didn’t get to choose what to spend her own money on. Still, Mama thoroughly enjoyed poking around all the rooms, a total lack of intellectual understanding of what she was seeing notwithstanding, because it is such a glorious monument to rampant eccentricity. She says. 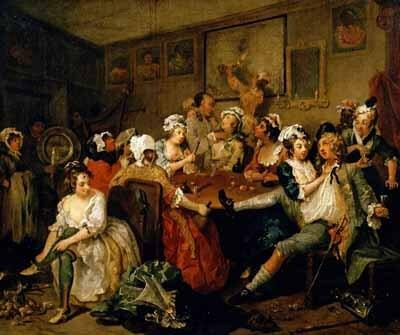 And they have lots of pictures by Hogarth, which Mama, the former historian with an early modern bent, finds absolutely thrilling, and who seems to have had a sharp sense of humour for the ages. I’m not sure what this picture is all about, but it looks like fun. Mama says yes. Obviously in such a small space they don’t have room for frivolities like a coffee shop (although they do have a souvenir shop) so when the call of the cool tactile objects became to much we repaired to Lincoln’s Inn Fields opposite the museum. Surprisingly, it isn’t a field. It’s a large London public garden with plenty of space to run round and have something to eat. We’d bought a picnic, but there’s a café, which looked nice. Mama thought. She does like her coffee. I got to hang out with two dance students casually trading moves on the bandstand, much to Mama’s delight. She thinks my dancing is amusing. Mama enjoyed watching all the office workers doing bootcampesque exercise on their lunchbreak. Mama says it’s called schadenfreude really, but that word is a bit long for me for everyday use. Anyway, I recommend the Soane Museum to all those toddlers still small enough to be firmly immobilized, to very well behaved children, and to their parents. Mama even took Papa there when they had some time to themselves when my Amazing Big Brother and I were staying at my Grandparents recently, although what they wanted that break for I do not know. Papa enjoyed it so much he donated actual money. This is very high praise indeed. This is what the Hitchhiker’s Guide has to say about the museum. Address: 13 Lincoln’s Inn Fields, London, WC2A 3BP. Opening: Tuesday to Saturday 10am-5pm. Last entry 4:30pm. Closed every Sunday, Monday and bank holiday. Tube: Holborn (Piccadilly and Central lines). Bus: Nearest stop at Holborn tube station.